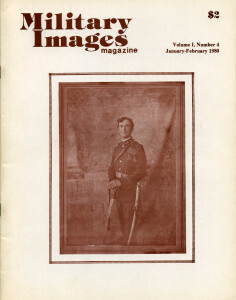 This issue of Military Images features a confident Trooper Charles E. M. Gilmore of the 4th U. S. Cavalry in a cabinet photograph taken in approximately 1905. The editor responds to frequent observations made by readers regarding what appears to be “backwards” images published in prior issues. Due to the processing technology of the time, these “hard” images were very similar to a mirror image, as there was no use of a negative image that was familiar in later eras. While some subjects would reverse their cartridge boxes or sabers for the purpose of an image, the ambrotype, daguerreotype, or tintype would still have certain uniform features shown in reverse, such as buttons, belts, or insignia. A reader appears to have identified the Zouave featured on the cover of the second issue of Military Images as Cpl. John A. Anderson of the 155th Pennsylvania Zouaves. The article features several examples of how images were displayed during the First World War. In a collection of nine images, the author provided a wide variety of both manufactured and homemade frames. Many of the manufactured frames could be easily changed to represent a particular branch of the service, and foreshadowed symbols more associated with the Second World War. Some of the handcrafted frames include a small life preserver and a frame made from the tip of an aircraft propeller. This article comes from a forthcoming book by the author, and uses the images taken by Lt. John E. Wilson, chaplain to the 167th and 168th Transportation Companies. Both companies saw service at the end of the First World War, which involved fighting in the Russian Civil War with the White Army and other Allied nations against the Bolshevik Red Army on the North Russian Front. Almost 800 men were assigned to these units and were responsible for maintaining and operating railroad lines in the area outside of Murmansk from April to July 1919. The photographs taken by Lt. Wilson document some of this little-known episode in American military history. The article outlines the search for the identity of one soldier whose image was found in two different items up for sale at a flea market in Pennsylvania in 1979. By connecting a clue from each image, the carte de visite and the 4×5” albumen photograph were able to bring to life for MI readers the story of Private John W. Beetem, who served in Company L of the 13th Pennsylvania Cavalry from August 1862 to July 1865. This article focuses on thirteen portraits taken from a photograph album that contained images from Troop E of the U.S. 7th Cavalry dating from 1895 to 1912. While most of the subjects are unnamed, the album allows a very interesting view of the uniforms worn by the troops during that time, which included service in the Spanish-American War and the occupation of Cuba. The article poses many possibilities for why the men wear a mix of old and new uniform components. Some of the troopers also wore uniforms that were not regulation, such as the trooper wearing a knit turtleneck sweater underneath his uniform or the soldier who modified the collar of his regulation fatigue coat to that of his own liking. The article reviews the newly revised A Photographic Supplement of Confederate Swords with Addendum by William. A. Albaugh, III. The author of this article, the second in a series highlighting the uniforms of the Federal navy, focuses on changes in uniform regulations as shown by four cartes de visite highlighted in the article. The author also provides a great deal of information on the background of the uniform regulations for naval engineers prior to the Civil War. There is a wide variety of images in this issue, some of which have a few surprises involved. One carte de visite image appeared to be a British sailor but with some research, turned out to be probably from a theatrical production. Another fascinating image submitted by a reader was a cabinet photograph taken in Tientsin, China, during the Boxer Rebellion, depicting an American private and an Imperial Russian NCO sitting in a painted prop automobile. Even more fascinating was the fact that another image of the two was submitted by a different contributor, with the same two soldiers wearing switched uniforms. The image shows a soldier most likely from a Pennsylvania Zouave regiment, but wearing a wonderful striped turban with tassel, holding an unusual firearm.